It was double celebration at Ajali, the headquarters of Orumba South LGA `on Monday 4th of October, 2013 as news filtered into town that the Supreme Court has declared comrade Tony Nwoye as the authentic candidate of the PDP which coincided with the official launching of the Campaign of Comrade Tony Nwoye Campaign. It was a mammoth crowd that ushered the entourage of the PDP candidate to the Ajali Township Stadium as party faithfuls, stalwarts and stakeholders received Comrade Tony Nwoye. While welcoming the Campaign entourage, the PDP Chairman of Orumba South LGA on behalf of the people of Orumba South pledged full support for Comrade Tony Nwoye on behalf of the Local Government Area. 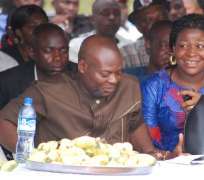 Comrade Tony Nwoye expressed appreciations while also reminding the people of Orumba South that the very foundation of the PDP has its roots in the Old Aguata Union from the contributions of one of her illustrious sons Dr Alex Ekwueme who few days ago also pledged support for the Tony Nwoye Campaign Organisation. The campaign saw the presentation of about 233 APGA members that defected to the PDP in Orumba South. The former APGA members also burnt their membership cards and were issued with PDP membership cards at the venue The Campaign Team immediately left for Aguata LGA where the train was received by range of stakeholders including artisans, Commercial Bus drivers, Okada drivers, Barrow pushers, PDP members and host of others at Ekwulobia. Hon Euharia Azodo, a former Speaker of the state house of assembly received the campaign train and offered prayers for Comrade Tony Nwoye and the campaign team. Comrade Tony Nwoye craved the indulgence of Party faithfuls and stalwarts to offer a minute silence for the souls of Anambrarians that perished at a stampede at Uke few days ago. He also reminded political parties that places of worship should be sanctified and not politicised and our religious institutions undefiled. Comrade Nwoye frowned at the draconian fees charged by state owned higher institutions in the state which has created enormous hardship for a `lot of families who sometimes had to borrow money to finance their children education, he noted that while as the President of the National Association of Nigerian Students(NANS) in 2003,he led a lot of struggles that led to reduction of exorbitant tuition fees charged by various institutions across the country, he pledged that if voted as Governor, he will ensure a sharp reduction in tuition fees by 50% across the state owned tertiary institutions in Anambra state.